NASA's Mars Science Laboratory spacecraft, halfway to Mars, adjusted its flight path today for delivery of the one-ton rover Curiosity to the base of Mars' Gale Crater in August.Tests completed aboard Curiosity last week confirmed all's well with science instruments the mission will use to learn whether an area holding an extensive record of Martian environmental history has ever offered conditions favorable for microbial life. "This may be one of the thickest exposed sections of layered sedimentary rocks in the solar system. The rock record preserved in those layers holds stories that are billions of years old — stories about whether, when, and for how long Mars might have been habitable." An instrument on Curiosity can check for any water that might be bound into shallow underground minerals along the rover's path. "If we conclude that there is something unusual in the subsurface at a particular spot, we could suggest more analysis of the spot using the capabilities of other instruments," said this instrument's principal investigator, Igor Mitrofanov of the Space Research Institute, Russia. Today the Red Planet is a radiation-drenched, bitterly cold, bleak world. Enormous dust storms explode across the barren landscape and darken Martian skies for months at a time. 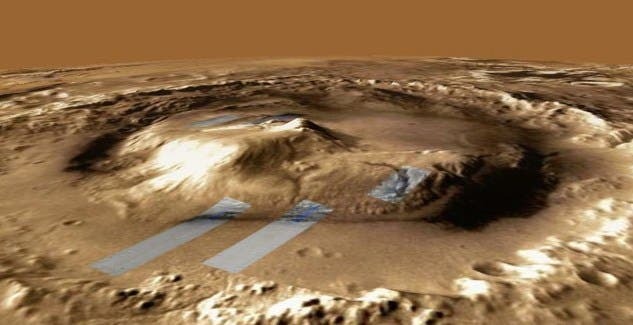 But data from the Mars Reconnaissance Orbiter suggest that Mars once hosted vast lakes and flowing rivers. In the gentle slopes around the mountain, Curiosity will prospect for organic molecules, the chemical building blocks of life. Mars Reconnaissance Orbiter has found an intriguing signature of clay near the bottom of the mountain and sulfate minerals a little higher up. Both minerals are formed in the presence of water, which increases potential for life-friendly environments. 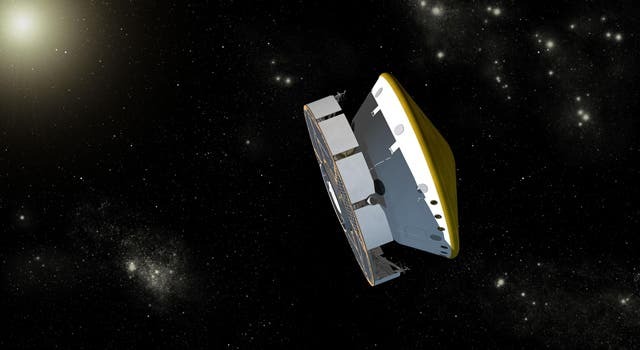 In the second of six planned trajectory correction maneuvers during the cruise to Mars, the spacecraft ignited thrusters for nearly nine minutes yesterday. Spacecraft data and Doppler-effect changes in radio signal from the craft, monitored in the mission control room at NASA's Jet Propulsion Laboratory, Pasadena, Calif., indicate the maneuver succeeded. "It is satisfying to get the second maneuver under our belts and know we are headed in the right direction," said JPL's Erisa Hines, systems lead for the maneuver. "The cruise system continues to perform very well." "We are now on a trajectory that will put us much closer to the point we want to hit on Aug. 5," added Tomas Martin-Mur, navigation team chief for the mission. The halfway point of the trip from Earth to Mars will be April 1, in terms of duration. The mission launched Nov. 26, 2011. It will land the evening of Aug. 5, 2012, PDT (early Aug. 6, EDT and Universal Time). One of Curiosity's 10 science instruments, the Radiation Assessment Detector (RAD) has been collecting data for three months, monitoring the natural radiation environment in interplanetary space. This information, particularly effects RAD has measured from recent solar flares, is crucial for design of human missions to Mars. In the past two weeks, the rover team has checked the status of the other nine of Curiosity's science instruments, powering them on for the first time since before launch. All the instruments passed these checkouts. Curiosity's landing site is near the base of a mountain inside Gale Crater, near the Martian equator. Researchers plan to use Curiosity to study layers in the mountain that hold evidence about wet environments of early Mars. First, the spacecraft must get there. Today's maneuver nudged the spacecraft one-seventh as much as the flight's first course adjustment, on Jan. 11. After the first maneuver, the trajectory would have put Curiosity about 3,000 miles (5,000 kilometers) and 20 minutes away from entering Mars' atmosphere at the right place and time. Like that maneuver, today's combined two ways of using thruster engines while the whole spacecraft spins at two rotations per minute. The spacecraft's cruise stage carries eight thrusters grouped into two sets of four. The maneuver began with about three minutes of firing one thruster in each set to change velocity along the direction of the axis of rotation. Then, to push the spacecraft in a direction perpendicular to the axis, each set of thrusters was used for five-second pulses when the spacecraft's rotation put that set at the correct orientation. The maneuver used more than 60 of these pulses spaced about 10 seconds apart. "The purpose is to put us on a trajectory to the point in the Mars atmosphere where we need to be for a safe and accurate landing," said Mau Wong, maneuver analyst at JPL. The descent from the top of Mars' atmosphere to the surface will employ bold techniques enabling use of a smaller target area and larger landed payload than were possible for any previous Mars mission. These innovations, if successful, will place a well-equipped mobile laboratory into a locale especially well suited for its mission of learning. The same innovations advance NASA toward capabilities needed for human missions to Mars. As of March 29, the spacecraft will have traveled about 196 million miles (316 million kilometers) of its 352-million-mile (567-million-kilometer) flight to Mars. Image at the top of page is an artist's concept of NASA's Mars Science Laboratory spacecraft during its cruise phase between launch and final approach to Mars. The spacecraft includes a disc-shaped cruise stage (on the left) attached to the aeroshell. The spacecraft's rover (Curiosity) and descent stage are tucked inside the aeroshell.